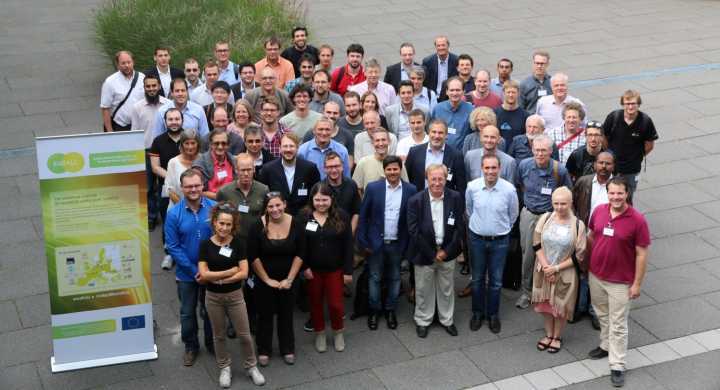 The European Cluster of Advanced Laser Light sources (EUCALL), a European Union-funded project that aims to foster links between accelerator- and laser-driven X-ray facilities, has completed the first year of its three year project period. The project successfully met all twenty of its milestones for the year, producing a new open-source tool for experiment simulations and developing specifications for several pieces of new scientific equipment. Within the EUCALL project, which launched in October 2015 and is coordinated by European XFEL, the accelerator-driven and the laser-driven X-ray sources of Europe collaborate for the first time in a comprehensive way on technical, scientific, and strategic issues. EUCALL involves approximately 100 scientists from European XFEL, DESY and Helmholtz Zentrum Dresden-Rossendorf in Germany, ESRF in France, Elettra Sincrotrone Trieste in Italy, MAX IV Laboratory/Lund University in Sweden, PSI in Switzerland, and ELI in the Czech Republic, Hungary, and Romania. The project also involves the previously established scientific networks FELs of Europe and Laserlab Europe. A first result is a simulation platform called SIMEX. Compiled from existing simulations, SIMEX integrates different steps of many types of X-ray investigations. Such simulations allow scientists to try out different settings and to optimize their procedures before their experiments, so they can make the most of their valuable beamtime. Recent simulations strive to help in approaching the “holy grail” of structural biology, a theorized technique called single-particle imaging, which would allow scientists to determine the structure of a single molecule at atomic resolution. SIMEX not only allows scientists to simulate single-particle imaging, but also to simulate various types of scattering and spectroscopy and tailor each to the characteristics of any synchrotron or free-electron laser. Planned add-ons are simulated X-ray analysis of laser-excited matter and recently developed plasma-driven accelerator experiments. The program was released in April 2016 and is successfully being applied to scientific cases. Other EUCALL milestones reached in the past year were a design report for a new transparent X-ray intensity monitor, as well as specifications for a sample holder to be used at all participating EUCALL facilities. The X-ray monitor is based on the design of a xenon-based intensity monitor that is currently used at the German research centre DESY’s FLASH X-ray free-electron laser and will be capable of dealing with both the hard X-rays to be delivered by the European XFEL as well as the ultrashort soft X-ray and ultraviolet pulses to be generated at the ELI facilities. The first prototype will be tested during 2017. In its first report, EUCALL’s Scientific Advisory Committee stated that the project’s successful approach should be continued beyond its initial three-year scope. “The technical developments in the EUCALL project are not only relevant for the facilities that are directly involved, but are of significant importance to other light sources that could profitably be involved on rather short notice, for example LCLS [in the USA]”, the committee reported. “The EUCALL project brings together experts from different types of light sources”, said Thomas Tschentscher, European XFEL scientific director and EUCALL’s project director. “The exchange of know-how and the joint developments provide new impulses to the individual light sources, and also pave the way towards new science and technology applications. ” EUCALL has received funding from the European Union’s Horizon 2020 research and innovation programme under grant agreement No 654220.